The automotive industry currently faces huge challenges. The fundamental technological paradigm it relies on, volume production, has become progressively more unprofitable in the face of increasingly segmented niche markets. At the same time it faces increasing regulatory and social pressures to improve both the sustainability of its products and methods of production. Building on a wealth of research, The automotive industry and the environment addresses those challenges and how they can be met in producing a sustainable and profitable industry for the future. The authors first discuss the development of the automotive industry and the problems it currently faces. They then consider the solutions the industry can adopt. The book reviews trends in more environmentally-friendly technologies such as the use of more sustainable fuel sources and new types of modular design with built-in recyclability. However, these technologies can only be fully exploited if methods of manufacture change. The book also describes models of decentralised production, particularly the micro factory retailing (MFR) model, which provide an alternative to volume production and promise to be both more sustainable and more profitable. The automotive industry and the environment provides both a cogent diagnosis of the environmental and other problems facing the industry and a blueprint for a better future. It will be widely welcomed by the industry, policy makers and all those concerned with sustainable transport. The structure of the automotive industry; Markets and the demand for cars; From manufacturers to responsible mobility providers; Sector shift, inter-sector dynamics and futures; Powertrain and fuel; Fuel cells and the hydrogen economy; High volume car production: Budd and Ford; Alternatives to high volume car production; Sustainability; Sustainable mobility; Practical steps towards sustainability; Automobility 2050-the vision; The distributed economy; The shape of the future; The roadmap; Micro factory retailing; Conclusion and implications. Dr P. Nieuwenhuis works at the prestigious Centre for Automotive Industry Research (CAIR) at Cardiff University. 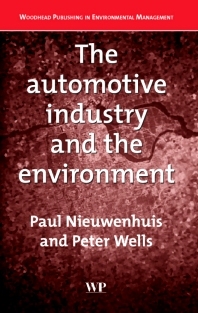 Dr P. Nieuwenhuis many publications include Motor vehicles in the environment (1994) and The death of motoring? (1997). Dr P. Wells works at the prestigious Centre for Automotive Industry Research (CAIR) at Cardiff University. Dr P. Wells many publications include Motor vehicles in the environment (1994) and The death of motoring? (1997).